The most beautiful time of the year is here, the fall. I adore the beauty of this season. To me the surroundings are awe inspiring for those who love to capture the scenic view through their lens. I planned to do so, but got lazy :(. Nature splashes its canvas with vivid colors like an artist. The gentle breeze that passes through brings in a shower of colorful leaves and makes a bed on the ground and sun's ray that strains through the yellow and orange shades of leaves embellish the surrounding with a golden hue. One can get mesmerized by the beauty of this season. At the same time it reminds me that it’s the beginning of something profound to come, yes the very bitter cold winter. Moody days make me lazy and I wish to stay on the couch without moving a muscle. But that seldom happens, because I make up my mind to go with something simple and comforting to prepare instead of lying on the couch and rely on some take out food. This recipe is on my lazy day cooking menu which needs no special attention. You chop some onions and tomatoes and simply throw it with spices into the pressure cooker along with the beans and wait for some time for it to get cooked. From start to end you need only a single pot which is the pressure cooker; there is not sautéing involved in this recipe. This recipe can be tagged for a novice cook. 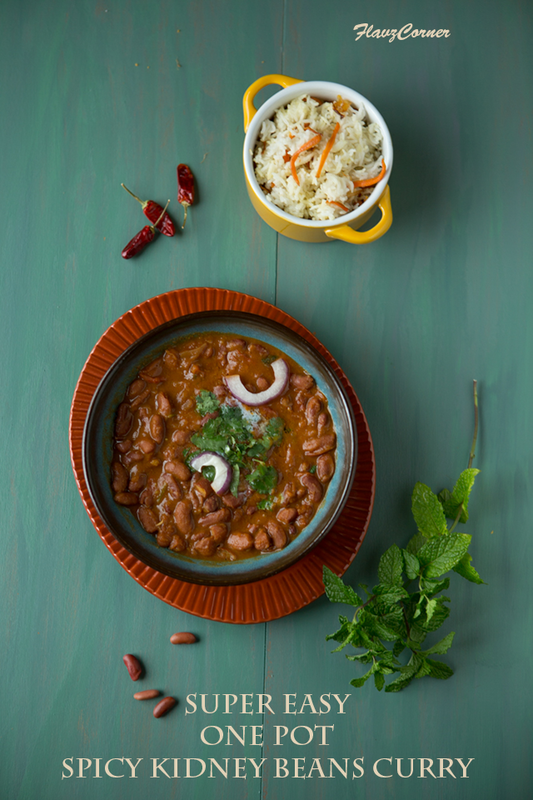 It’s that simple and you will end up with a delicious spicy Rajma curry that can be served with some pulao or steamed rice. Last weekend when I made it, I served it with some carrot rice. I read this quote somewhere that 'Laziness fuels more laziness'. Are you lazy to cook an elaborate meal today? Then this recipe is for you my friend. A novice cook can also try this recipe without any failure. Its fool proof and simple. 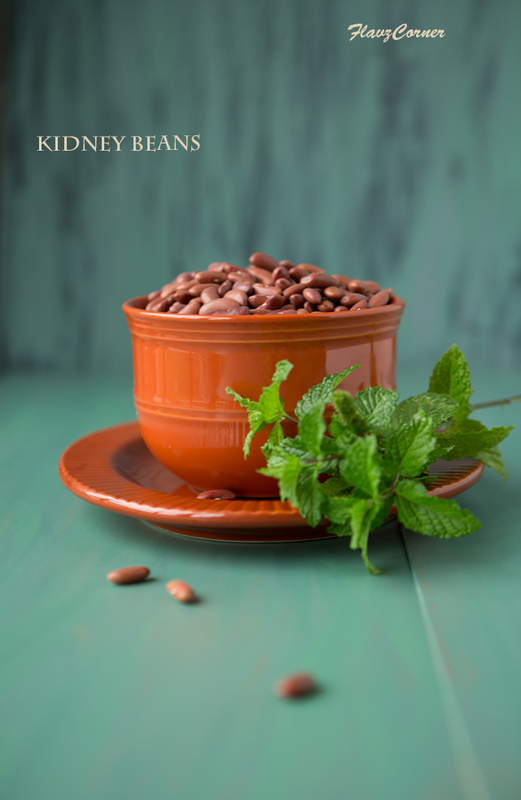 Soak kidney beans with 6 cups of water for over night. 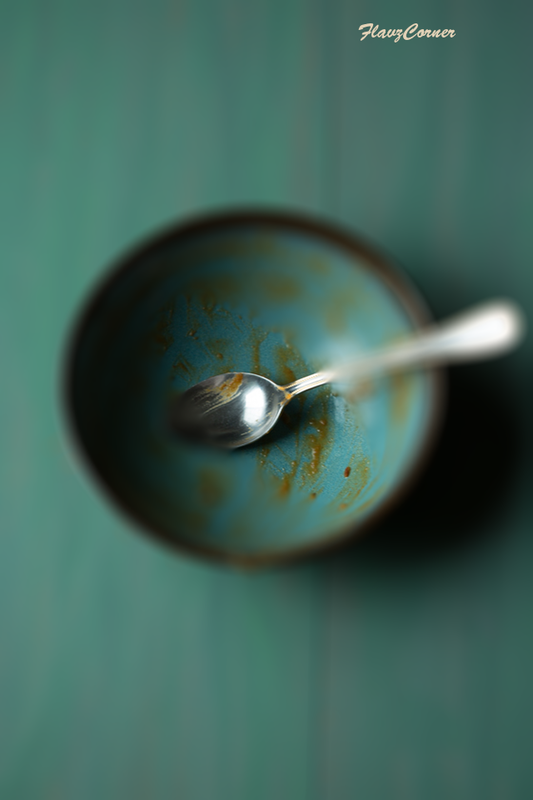 After soaking for minimum 8 hrs, rinse the kidney beans thoroughly in running water and drain. Transfer the kidney beans to a pressure cooker followed by 4 cups of water. Add rest of the ingredients to the pressure cooker except garam masala. Pressure cook for 20 whistles and turn off the flame. Once the pressure subsides, open the lid and check the texture of the beans, it should be mushy. Using a ladle mix everything well. Check for the gravy consistency and adjust the amount of water during this step. Add garam masala; close the lid and cook for another 5 whistles and turn off the burner. Once the pressure completely subsides, open the lid and mush the curry with the back of the ladle to get the right consistency. Add the heavy cream or coconut milk and garnish with chopped Cilantro leaves and onion slices. 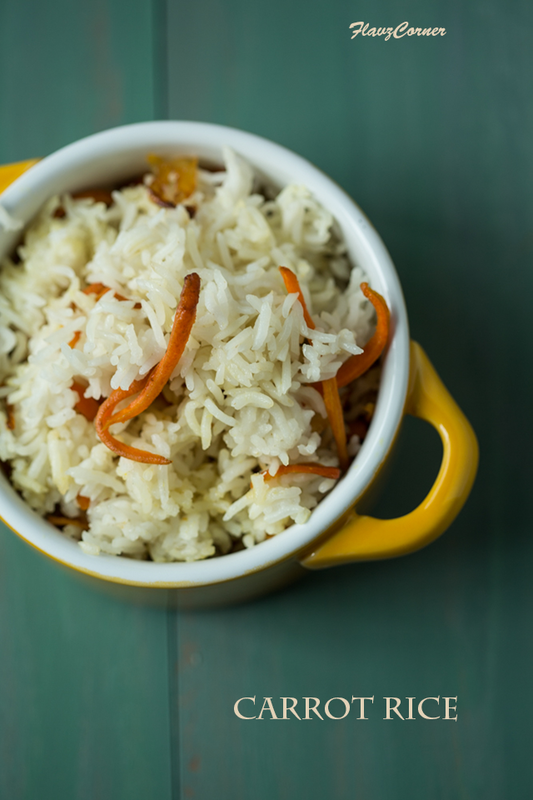 Serve with warm steamed pulao or plain basmathi rice. 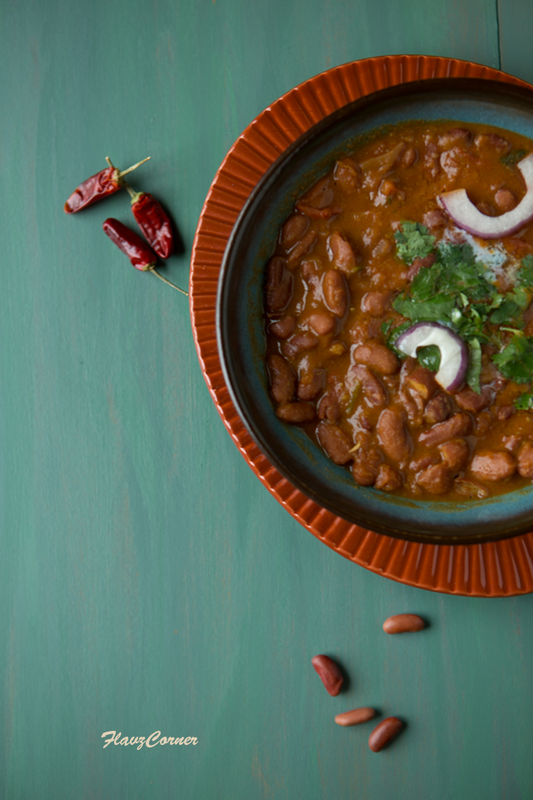 Pay attention to the kidney beans I had used in this recipe. I used the light brown colored beans which cooks faster than the darker version. Don't forget to soak the beans the day before. Always discard the water in which the beans is soaked to remove the toxins the kidney beans contains. Make sure to rinse thoroughly to remove all impurities from the beans even if you got an imported quality beans. Adjust the amount of water and spices per your taste. Kidney beans tastes better when the gravy is spicy. This is a great vegetarian meal! That carrot rice looks fantastic as well. Yup, fall is my favorite season too. Ours has been pretty warm this year, although we've had enough cool nights to encourage the cooking of comfy dishes. Like this one! Perfect for this time of the year -- thanks.